As a home contractor or remodeler, your website is the hub of everything your business does online. Having a website isn’t just about selling your services — it’s also about providing something of value to potential customers. 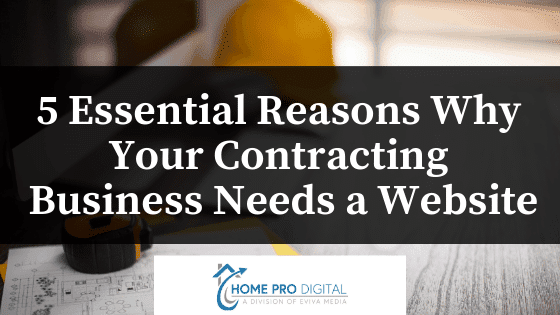 Here are 5 reasons why a professional website is critical to the success of your contracting business. Your contracting website is your digital business card. As many as 97% of consumers can be expected to search for information about local businesses online. Homeowners engage with a contractor’s website for a closer look at their business. It acts as a business card, sales pitch, and portfolio all in one. The most valuable function of a contracting website is to facilitate communication. By prominently displaying your contact information and offering an easy way to reach out, you empower the homeowner to begin a conversation or request a quote. Linking to your social accounts on your website makes it even easier for people to stay engaged with your growing contracting business. Your contracting website is an opportunity to make a controlled first impression. Showcasing your best work brings your audience into your digital showroom. Featuring real customer reviews on your contracting website builds trust: more than 70% of consumers report that good reviews positively influence their opinion of a business. A compelling home contractor website demonstrates the high quality of work that sets you above your competitors. Homeowners are going to want to see past projects that you’ve completed and a photo gallery will absolutely increase the number of leads your website generates. Including before-and-after shots is a powerful way to create trust among customers. A good website lays the foundation for successful marketing. When you make it easy for prospects to connect with you, you increase your visibility and raise your public profile. This helps to build a base of contacts for future outreach. With proper care and maintenance, your contracting website should generate plenty of leads to help you grow your business. Contracting businesses of all sizes rely on their websites to function as their public face. In fact, a good website can level the playing field between businesses of different scale. You don’t need a big marketing budget to build an impressive contracting website. That’s where Home Pro Digital comes in. Schedule a free website strategy session today.